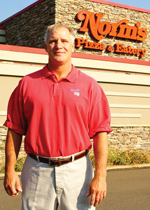 Norm’s Pizza and Eatery was established in 1994 in a small location on Spring Street, Wilkes-Barre. In 2002, in need of a larger building with ample parking, Norm’s moved to its current location at 275 N. Sherman Street. In the last 20 years of business, Norm’s has always strived for the same goals: great quality, great service, and affordability. Our specialty is a fried Sicilian pizza. Round pizza, stromboli, hoagies, salads, and homemade soups, are other customer favorites. We use quality ingredients, make our pizza dough and sauce fresh daily, and age our cheese. We are honored to have been serving the Wilkes-Barre Valley for the last 20 years.